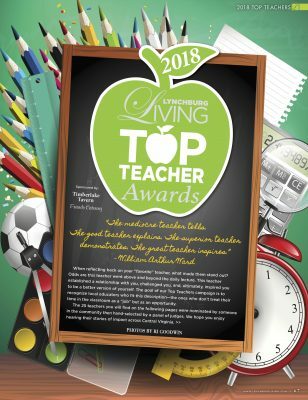 Several University of Lynchburg alumni are among the best school teachers in Central Virginia, according to Lynchburg Living Magazine. The magazine published its Top Teachers feature on March 1. A panel of judges selected 25 excellent teachers from among those nominated by members of the community. Megan Harker Emanuel ’01, ’09 MEd teaches theatre at Brookville High School. Her profile describes how she grew Brookville’s theatre program from the ground up. In 2007 it had no “lights, mics, set pieces, costumes, or funds,” but last year the school had a good showing in the Virginia High School League One-Act Festival and performed Hairspray and Seussical before sold-out crowds. “I get the most joy from watching my students gain self-confidence, public speaking skills, and poise as they progress through the program,” she told the magazine. Bobby Markey ’18 MEd, who teaches mathematics at Brookville High School, is earning his master’s degree in educational leadership at Lynchburg now. His nomination noted his accessibility and willingness to help students when they are struggling with a concept. He became a teacher because he “found a passion in helping others learn math in ways that they never could understand it before,” he said. Charles “Woody” Wooldridge ’78, a physical education teacher at Tomahawk Elementary, noted that he has taught 57,600 classes and 27,000 students in his 40 years of teaching. His nomination noted his sincere caring for the health and well-being of students. “There is nothing better than to hear from a child the phrases, ‘I did it,’ or ‘I can do it,’” Wooldridge told the magazine. In addition to the Top 10, Melissa Sales Ferguson ’99, ’05 MEd, who teaches at Sheffield Elementary School, and Mary Rush Bailey ’03 MEd, of Rustburg High School were listed among the top 25 teachers in the region. 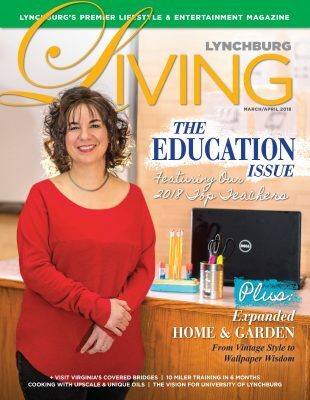 The March/April issue of Lynchburg Living focuses entirely on education. Printed copies can be picked up from magazine stands at various stores and restaurants across the region. The Top Teachers list can be read online here. The magazine also includes an article about University of Lynchburg’s strategic plan, Vision 2020, and the upcoming transition to the University of Lynchburg name.